Renoir was founded in California by Jerry Fells in 1946. He also founded Matisse in the 1950s. Both companies went out of business in 1964. Following the style of the Arts and Crafts Movement their jewelry was highly stylized. 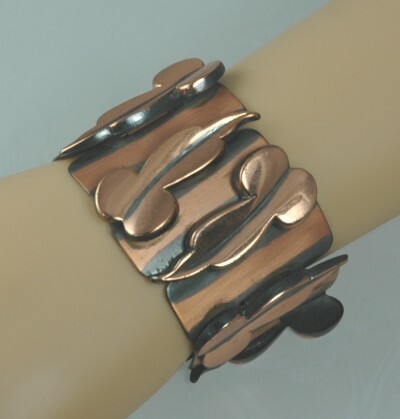 This wide linked copper bracelet is a perfect example. Artistic raised leaf designs decorate every other link. This vintage bracelet closes with a fold-over clasp and the hallmark "Renoir" in script, which dates to about 1952, is found on the clasp. See this piece in the book Copper Art Jewelry by Burkholz and Kaplan on page 137. Condition: Excellent vintage. Warm copper patina has not been polished. Measurements: 6 1/2" long.